Less than 24 hours to go and I’ve actually run out of plot, the story’s written, I know there’s always something that can be added, but right now, after 30 days flat out on it, I can’t think of anything. Mind’s gone blank. I have another 1,800 words to write. I was 2,500 words short when I woke up this morning, so I wrote a quite unnecessary scene about my protagonist going for a walk to clear his head. The only thing I can think to add right now are more descriptions of locations, so I’ve listed eight of the main settings of the novel and hope to write 250 words about each one today, which should bring me well over the 50,000 before midnight tonight. 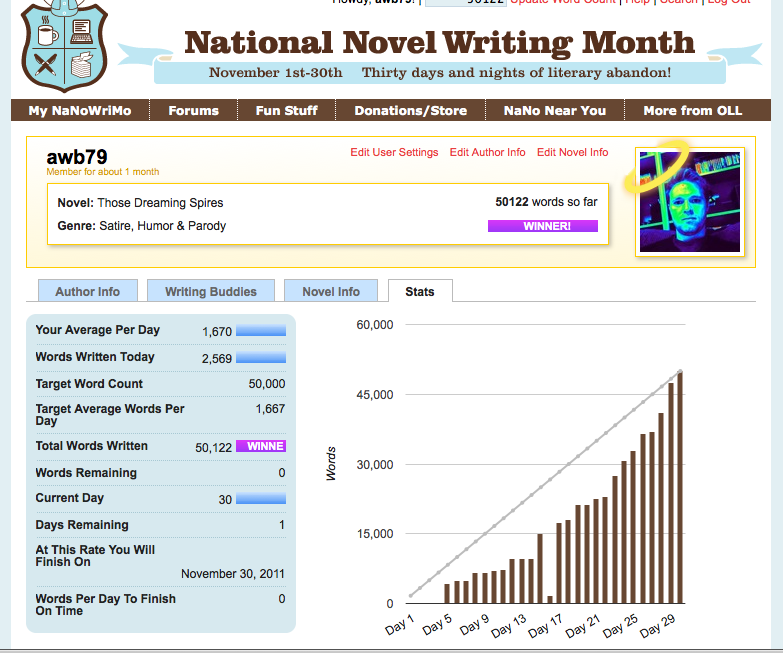 The 50,000 word count that marks the end of NaNoWriMo is so close now I can almost smell it! Well there is a lot of leaking Victorian plumbing, mild cannibalism and a geriatric in need of a good wash, so it ought to whiff a bit.